There is not a large volume of coverage of the suffrage movement within the motoring journals of the period. The editors of the publications were also invariably wealthy, establishment men who were unlikely to have been supporters of the suffrage cause. The few articles and references to the movement give a revealing flavour of how the suffrage campaign and the women who participated in it were viewed by many of their contemporaries. 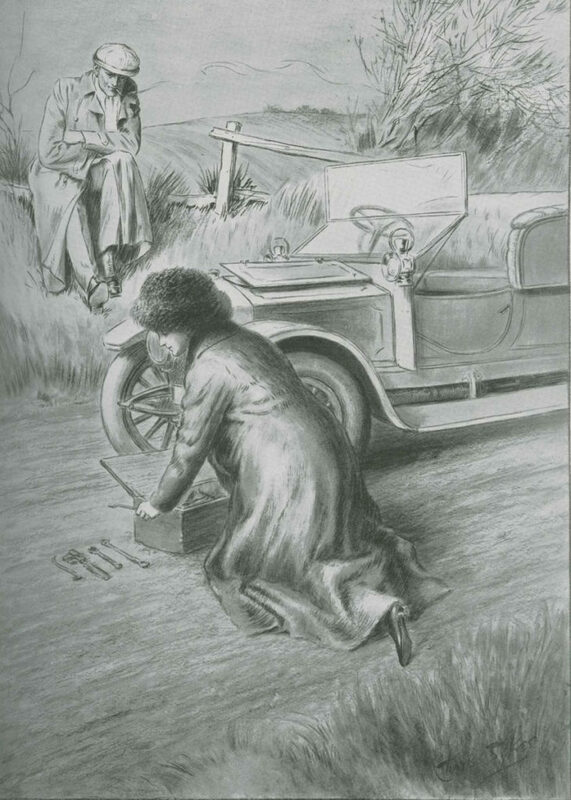 There are two short stories in Car Illustrated, both published under noms-de-plume, which have themes of suffragettes being outwitted and wooed by men. Being a woman such faulty manipulation of Bradshaw might be expected and condoned: but being a Suffragette – well, one feels justified in lifting one’s eyebrow. The militant mummy case of a woman vanished in the surrounding darkness, and there lay beneath those luxurious rugs only the quivering reality of the natural woman. Even if the franchise should never reach woman during her lifetime, with such an unusually enlighted proxy by her side, she really thinks – she would not mind so very much after all. “I wouldn’t give a snap for a woman that couldn’t keep her car going on the road. It is high time that women gave up their foolish dependence on men”. “You’ll always make fun of the W-women’s M-movement now”, she faltered, “J-just because I have been so s-silly”. The Bachelor tells her she was not silly but “the pluckiest little woman in the world”. The story ends then in a roadside clinch as snow begins to fall. The motoring press in the early 1900s carry a few stories reporting on direct action taken militant suffragettes, where there is a motoring element to the story. Motor magazine reports on “the work of Suffragette window-smashers” at the car showroom of Keele and Co in New Bond Street in London in 1912. In 1914, they show an image of ‘the latest suffragette outrage’, the burning down of the public library at Northfield in Birmingham, which is near to the Austin works and used by Austin workers. Further research on this story reveals that found fastened to the fence outside the smoking ruin was a book by Christabel Pankhurst with a note saying “To start your new library”. 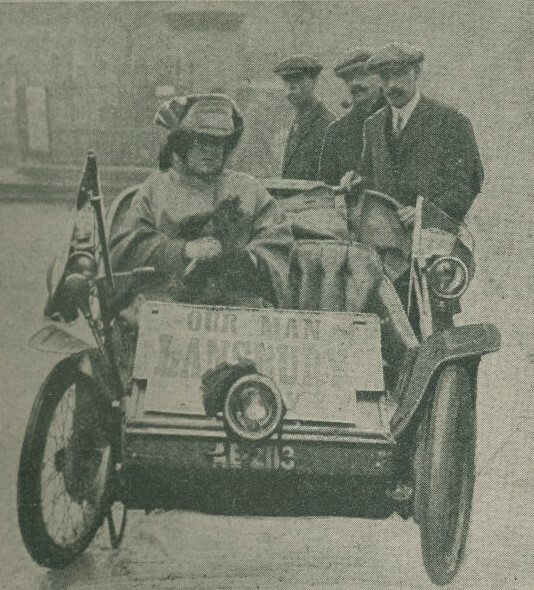 Cyclecar magazine published an image in 1912 of a woman driving a car campaigning for the suffrage cause in the “Bow and Bromley election” The slogan ‘Our Man Lansbury’ can just be made out on a banner on the front of the car. The sitting Labour Party MP of the Bow and Bromley constituency, George Lansbury, resigned to trigger a by-election in which he would stand on a platform of votes for women. He was supported by prominent figures such as Keir Hardie and Josiah Wedgwood, as well as Millicent Fawcett of the National Union of Womens’s Suffrage. The more militant suffrage organisation, the Women’s Social and Political Union (WSPU) were less supportive as Lansbury had acted independently from them. 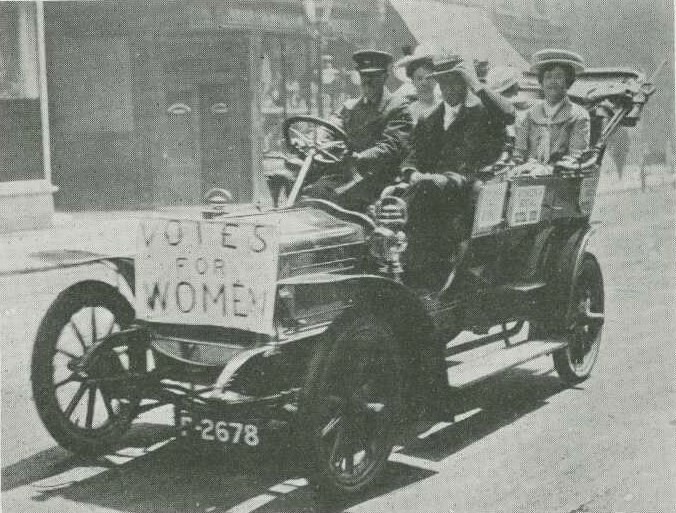 Consequently, the WSPU would not supply cars to carry people to the polling stations. Lansbury was unsuccessful, losing to the Conservative candidate Reginald Blair who campaigned under the slogan ‘Women Do Not Want Votes’. The ladies showed good sense, though perhaps a little inconsistency, by putting a man at the wheel! Mere men, however, were entrusted with the work of steering the cars, and they seem to have performed their duty most carefully, though the volleys of badinage they received when passing cab-ranks and other groups of scoffers might have discomposed them. 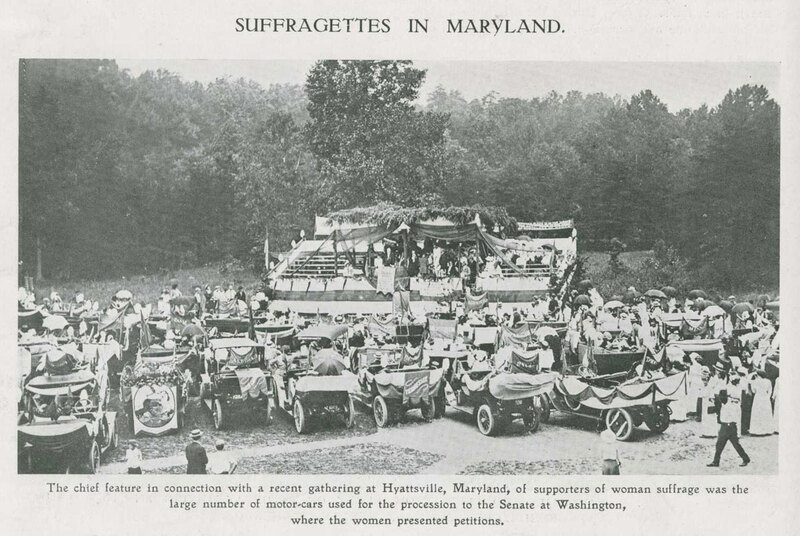 A large suffrage rally in Maryland, USA in 1913 is reported by Car Illustrated with the emphasis on the “chief feature” being the number of cars participating. Most motoring journals during this period include regular features by women writers mainly focusing on motoring fashion, society events and related anecdotes. There are some interesting and telling references to the suffrage movement in ‘Modes, Motoring and the Rest’ in Car Illustrated in 1913. In the March 5 issue of Car Illustrated, there is a story about the fear of “the naughty suffragettes” kidnapping the children of political figures. One mother even employs two security guards to follow their children, another won’t let them out of “the precincts of their own garden”. The “Suffragettes” kicked, fought and screamed for about twenty minutes, all the guests being under the impression that the scene was a genuine display of energies. How flattered the genuine Suffragettes must be to realise that no party, no play, no meeting, or sermon is complete these days without a reference to their Cause! Indeed, so long as their war fever is fed by the public in this fashion, so long will their vulgar fury suffer no abatement. I heard a little girl tell her mother that she did not want a book of fairy tales that was being offered to her. “I want a story about a little girl who grew up to be a great woman and could fight policemen, like the suffragists”, she said. The mother, who was hanging on to the fairy-tale book as if she would like to read it herself, looked very distressed. The author of this story is ‘Geoffrey Tempest’. This pseudonym was probably chosen as it is the name of the main character in a best-selling 1895 novel ‘The Sorrows of Satan’ by Marie Corelli. In that novel, Geoffrey Tempest enters into a Faustian pact when he inherits a fortune. The Car, No. 216, July 11, 1906, p.263. The Car, No. 586, August 13, 1913, p.30. The Car, No. 563, March 5, 1913, p.119. The Car, No. 569, April 16, 1913, p.311. The Car, No. 605, December 24, 1913, p.287.